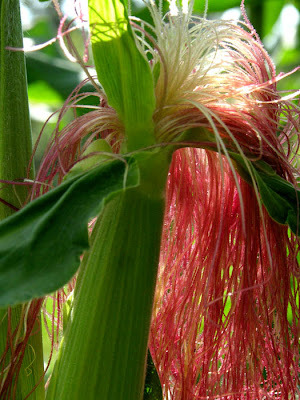 When I was younger we used to grow some beautiful multi coloured corn, as a child I loved the stuff, it was inspirational and looked amazing. As a child I would carefully save seeds each year and only plant the most amazing ones, every year the resulting cobs were far superior to their parents. After doing some research it appears that each colour has a different nutrient profile and pretty much every colour other than white is better for you than the usual yellow colour. In Australia we pretty much only see yellow corn, in Africa they only see yellow corn when they are starving and foreign aide comes in, other than that they predominantly grow white corn as they see yellow corn as a famine food, native people in the Americas who originally domesticated corn grow a multitude of colours. After moving here and having a little extra space I wanted to track some coloured corn down again to grow for cornflour as well as animal feed. Nowhere had it listed for sale. I emailed all of the seed companies that used to stock it and they all replied saying that they no longer stock it. I then emailed a few seed saver groups to ask if any of their members had some that they were willing to sell me, the replies ranged from "we do not save seed, we only buy bulk heirloom seed to distribute to members" to "we do not sell seeds, please google heirloom seeds and leave us alone". Further research showed that many of the corn varieties that I used to grow are now extinct in Australia. This is rather worrying as corn seed not be imported into Australia easily. After much searching and asking around I found a lady in Western Australia who had several varieties of multi coloured corn. 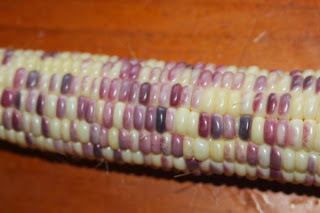 She had one variety that she called "glass bead corn" that she had selected from the prettiest seeds from the best cobs of an Indian corn that she had. She claimed that some of her cobs looked similar to the glass gem corn that you may have seen on the internet. I ordered two packets of these corn seeds, one to grow and one as insurance in case I lost the crop and had to replant, and eagerly waited for them to arrive. When the seeds turned up I was a little disappointed, there were 60 seeds in the packet and only 10 of them were anything other than yellow. Some were nicely coloured, some had a single coloured spot on them, but most were just yellow. I know that the yellow seeds carry hidden genes for colour, but I had hoped for a few more coloured seeds in the mix. I carefully planted the seeds out in a way that would maximise the coloured pollen landing on the yellow cobs and hopefully would result in a lot of coloured cobs. Then the birds came, they scratched through the garden and kicked mulch everywhere. I was not certain if any of the seeds were left in the soil but I continued to water them, to my surprise most of the glass bead corn seeds had not been eaten and they germinated for me. The corn plants themselves were remarkable, they have a lot of genetic variation which means that this strain is not overly inbred and should adapt to various climates well. They survived an extreme summer here by growing to a height of between 2 and 3 metres tall. We had no rain, extreme heat, and high wind, some plants were blown over or even snapped by the wind, but overall they all grew very well. We had also grown a packet of sweet corn, only one single plant survived to maturity as the conditions were too harsh this year, that highlighted the strength of this amazing strain of glass bead corn. As the plants grew some of the leaves were variegated, some of the stalks were bright red, some of the pollen bearing tassels were purple or red, some of the silk was red or purple or yellow, even some of the sheaths covering the ears were coloured, on top of that most plants were producing two large ears of corn, I had a good feeling that I could turn this corn into something great. Next year I will have to try and remember to get some pictures of the plants as they are growing, some of them would not look out of place in an ornamental garden. After harvest I had some beautiful cobs as well as some mediocre ones. When people see these cobs they are amazed by the colours and patterns of the seeds, there are yellow, white, purple, pink, red, orange, black, brown, striped, spotted and even marble swirled coloured seeds on each cob. It is not quite as good as the ones I grew when I was younger, but I plan to eat all the substandard cobs/seeds and only plant the best, this way it will only take a few years to turn this into something truly amazing. I will probably sell a small amount of the Glass Bead corn seeds in Australia each year. 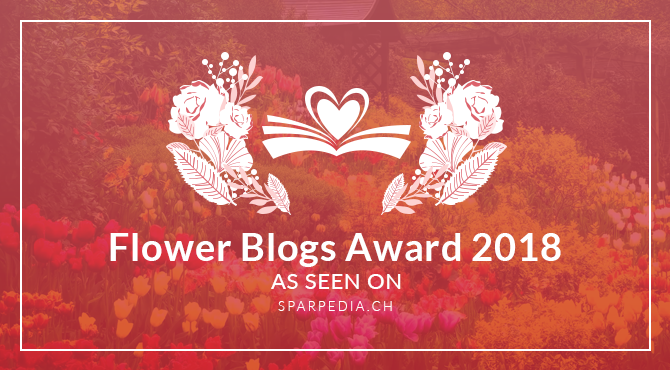 These are non-hybrid, organically grown, open pollinated and non GM seeds. There will be some yellow seed in each packet as well as a mix of colours, these yellow seeds will all carry recessive genes for a multitude of colours and patterns and besides that cobs look nice with a small amount of yellow mixed through. I will put details on my "for sale" page so that you can contact me. Do you have any seed for sale right now. Is it more likely to be in 2014 if not now. Where in NSW are you please. My wife was born in Tamworth but lived in Scone all her life. Well until she was 17 and moved to Sydney. Her folks still live there. We live in central west NSW. We do have glass bead corn seed for sale at the moment. I try to include a decent number of seeds in a packet so that you can get a good crop out of it and if you save seeds yourself you should not run into trouble with inbreeding depression which can be trouble in corn.